Three key ideas inspire my motives for writing this post. First – I recently read a series of posts asking the question, “Is there a ‘the Christian Worldview” by Roger Olson. You can read the first in the series here (then follow Olson’s links to the rest) if you want to enjoy them. Second – Three years ago I was asked by a local Christian high school to help develop curriculum and teach a course to 11th-Graders called, “Christian Philosophy and Worldview.” Some of my convictions in this post flow out of the things I worked on with the students over the course of two years in that class. Third – I really like thinking about this stuff for some reason. It’s just interesting to me, and since I have a login and password to the blog, I get to write about it!! Big Idea #1 – Knowledge: Every worldview appeals to a truth-source in order to answer the question, “How can I know anything, and how can I know that what I say I know is actually true?” In technical terms, this part of a world view is epistemology. In the most general terms, epistemology is asking a few important questions such as: (1) Is it possible to actually know anything, and if so — what? (2) How does a human come to know things? Are we born with certain knowledge and/or can we learn as we go? (3) How is what I think I know shaped by my immediate surroundings, culture, circumstances, etc? Thus, is there anything more true than (or even true in addition to) what I know and see, or is what I see all that is knowable and true? Further, is what I see and know actually true. That is, does it correspond to, and can it explain all reality, or am I missing something? (4) Is being sure or certain about something the same thing as knowing it, and the same as it being true? There is obviously much more that can be said about epistemology, but these four ideas are a helpful way to jump into discussion about it. The bottom line is this: Every worldview has a truth-source, and a basis by which truth and knowledge about reality are evaluated. More on this below as the post unfolds. Big Idea #2 – Origins: Every worldview attempts to answer fundamental questions about the origin and purpose for the existence of the cosmos, and everything in it (and outside of it, as the case may be). The question goes like this: “Why is there something in existence instead of nothing at all, and where did the something that exists come from?” Answers to this question are all over the map including some world views that assert that there really isn’t anything, and the sooner we realize it, the happier we’ll all be. Of course, if that’s the answer, we can go back to epistemology and ask, “How do you know there’s nothing instead of something, and does your knowledge about there being nothing instead of something correspond to reality?” In other words, is it true? But remember — the question of origins has at least two parts: (1) Why is there something instead of nothing? and (2) Where did the something come from? Agreeing with the premise that something exists does not necessarily explain where it came from. Most every worldview attempts to answer the second part of the question as well. Big Idea #3 – Conditions: Every worldview attempts to speak to the condition of the cosmos, and to give answers about why things are the way they are. The questions might sound like this: “Is anything wrong with the world that exists? Is anything wrong with people? What is right and what is wrong, and how do we know the difference? Further, if there really is something wrong, was it always like this, and if not — how did it get this way?” If you think about it carefully, every worldview attempts to answer these questions, but the answers are very different in many cases. I’ll give a few examples in just a bit. Big Idea #4 – Solutions: Every worldview approaches the question of conditions with various solutions. “If there are problems, how do we fix them? If they are being fixed even now, how is it happening? Can the problems really even be fixed, and if so, what would it take to make things better than what they are right now?” The concept of solutions must correspond directly to conditions in order to form a coherent worldview. If someone says, “this is what we should all be doing,” there needs to be a direct connection to how that activity will solve the problems that the worldview is asserting. Again, I’ll share two or three examples of what this looks like below. Big Idea #5 – Destination: Every worldview attempts to answer the question, “Where is everything headed, and what does the future look like?” Thus, every worldview ends with some kind of statement or conclusion about what we can all expect based on (1) what we know, (2) why we all exist, (3) what’s wrong with the world, and (4) what has been done, is being done, and will be done about it. There are two Greek words that touch on the idea of destination. The first is telos and the second is eschaton. Telos can be translated in various ways including end, fulfilled, goal, and outcome. In John’s Gospel (cf. Jn. 19:30), Jesus uses the word tetelestai as a perfect-indicative-middle/passive verb which is translated, “It is finished.” A longer way of communicating the grammatical implications is something like, “Everything has been, and therefore is now, and always will be from this point forward — accomplished.” Here are a few verses where the word “end” is telos — Mat. 10:22, 13:39, 40, Lk. 21:9, 1 Cor. 10:11. The second word, eschaton/eschatos (you might hear the word eschatology trying to poke its head out here) can be translated variously as farthest, final, last, and uttermost. Here are a few places it’s used in the New Testament to talk about the end using the word eschatos — Jn. 6:39, 40, 44, 54, Acts 2:17, Heb. 1:2, 1 Pet. 1:5, 20, 1 Jn. 2:18. The point here is that every worldview attempts to predict (or even to say unequivocally) where all history is ultimately headed, and how everything will end. In my opinion, the answer to this question is easy. Yes. If you ask the average person five questions: How do we know anything, where did we come from, is there anything wrong with the world, how do we fix it, and how will it all end? — most of them will give some kind of answer to every one of these questions. Thus, if these five big ideas form a legitimate framework for a worldview, then most everyone has one. If they are part of a religion, or if they subscribe to some well-developed philosophy, the answers will come easier than they would to those who have not taken much time to think about it. But in the end, everyone tries to answer these questions, and many people believe their answers are the right ones. And here’s the thing about a worldview — whatever your answers are to those five questions determines the way you live in the world. World-view = world-do. The way you see things determines the way you live. That’s why a worldview is so important, and that’s why Christians must work hard to better understand what it means to have a Christian worldview. Knowledge: The material universe is all that there is. Through scientific observation and data-collection about the material world we may discover truth and knowledge. Origins: The material universe has come into being as a random event without a purposeful or personal cause, and life has evolved to its present state through natural selection. Conditions: The concepts of good and evil are contrived and fantasy. They are beliefs, and therefore immaterial, and therefore they do not actually exist. In reality, since material is all that exists, the current state of things is simply the natural result of our current moment on the ever unfolding evolutionary time-line. Destination: …result in a better world tomorrow than the world we live in today, just as the world today has evolved to be a better world than the world of yesterday. *Note – Marxist-Leninism, Socialism, Communism, and Secular Humanism resonate with science as the basis of all knowledge, and evolution as the basis of origins, though they have different answers to the question of conditions, solutions, and destination. Knowledge: Knowledge is generally subjective, and is known only the the individual based on immediate sensations which are generally considered either painful, indifferent/neutral, or enjoyable. Origins: Hedonism does not have a central view of origins, and many of the original philosophers were Greek, and perhaps polytheistic. Among theistic hedonists, there are varying perspectives that generally conclude that god/gods created humans to be happy and enjoy pleasure. Conditions: Present conditions which are undesirable are the direct result of personal or corporate actions that bring about pain-sensations (e.g. harm) for either self or others. Solutions: The pursuit of maximum pleasure-sensations for self and others is the ultimate good. Thus, obeying the law, regarding the State, and the pursuit of friendships are not objectives in themselves, but rather engaging them in ways that bring about pleasure. Destination: The ultimate goal is personal happiness and the abolition of suffering. Through the pursuit of the highest pleasure for self and others, the greatest experience of happiness will be experienced by everyone. Knowledge: There is no universal, objective, knowable truth or reality that can explain how the world is. Thus science cannot answer every big question. Rather, local stories, narratives, traditions, and practices inform local conclusions about reality and knowledge. Origins: God is not creator, and humans are not centrally important within the cosmos. Through chance, the cosmos has come to exist, and through punctuated evolution and natural selection, life has come to be as it is. Conditions: Since what is right and wrong is primarily local (beginning with the individual, and working outward to relationships — family, neighborhood, community, etc), present conditions are adverse insofar as individuals work against what is right and true for others in order to impose their own version of “right” and “true” on those who are not living within their story. Solutions: By ceasing to impose ethical boundaries on others who do not subscribe to our beliefs, and by letting each person find his/her own way — each person may be set free to determine their own individual sense of good, joy, and happiness. Live, and let live. Destination: There is no grand, ultimate, or shared purpose in the unfolding of history. Each person’s life, and the world in which we all live, will be the result of what each of us makes of it. There are plenty of other religious and philosophical world-views that could be discussed, but these three seem to open the door to helpful comparison when considering the implications of taking each worldview to its ultimate or logical extreme. Knowledge: All knowledge ultimately originates with God, who discloses what may be known in at least three ways: (1) Through the human capacity to observe and understand the created cosmos (science), (2) Through supernatural self-disclosure (special revelation from God to people, and the resultant scriptures that record God-given insights), and ultimately (3) Through the incarnation of God himself in the person of Jesus Christ (incarnation). Origins: Both the visible cosmos and unseen dimensions of the Spirit are the purposeful, intentional, and personal creation of God who is the rightful owner and King over all He has made. Conditions: The human race, the crowning and image-bearing part of God’s creation, who were originally given the vocation of ruling the world on God’s behalf, have acted autonomously and against God’s will, and have failed to bring creation under God’s rule. They have instead partnered with subversive and anti-God ideas and powers, and have allowed evil — and have perpetuated evil in the creation. Solutions: Through the life, death, resurrection, and ascension of a new version of humanity – Jesus Christ – and through those who live in the world as his obedient followers, the world is again being made right. Destination: The reign of God will again fill the heavens and the earth, and all that was dis-integrated will be re-paired again. Heaven and Earth will be reunited into a New Creation, and God will live with His people in a world where everything that once caused its ruin will be removed and discarded. (5) God will restore, rule, and reign over all things again. If Ken Ham is right, then mosquitoes, buffalo, ground squirrels and tigers were originally created to live forever — but then Adam’s sin caused them to eventually die as well as become carnivorous. Is this true? Is this what the Bible teaches? Is this what a person must believe in order to have a Christian worldview? Is the life, death, and resurrection of Jesus primarily about penal substitution and positional justification by faith? Is the central message of the Christian Gospel, “Jesus died for your sins so that you can go to heaven when you die”? Further, is salvation even about leaving the earth and going to another place called heaven – to live there forever – after you die? These are the kinds of particular questions that keep us all busy arguing and assuring others that those who disagree with us about our particular conclusions (even if we agree on the larger conclusions) are actually heretics. 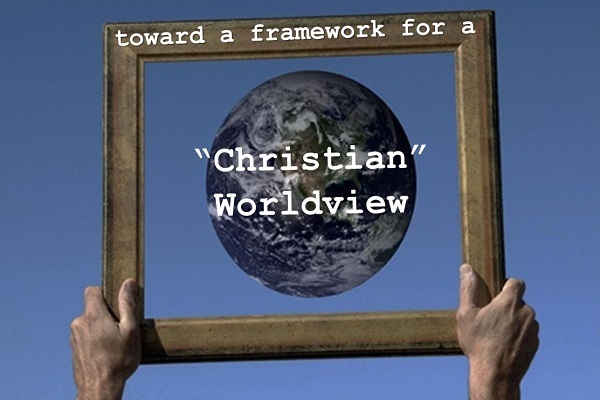 I personally see this five-faceted framework as a wonderful way of engaging fellow believers and unbelievers alike about the way we view reality — and the way we live in the world. I’d like to propose a couple of action steps as you think about my conclusions. 1. Try, this week, to listen to the conversations of people around you. Notice how the themes of many conversations will fit perfectly into one (or several) of these big ideas. I think you’ll find, as I have, that these are the five big things people constantly talk about in one way or another. Use this outline as a way to engage them in dialogue. 2. Talk to me below about any one of the five ideas, and share what you think needs to go into it in order for the longer answers (the particulars) to be truly Christian. I’d be interested to see how that theme emerges here. James K. A. Smith has, in “Who’s Afraid of Postmodernism?,” convinced me that Christianity is compatible with many aspects of postmodernism. In fact, I think both modernism and postmodernism have strengths and weaknesses. Luke – I have not read Smith’s work on this (is it book or blog? — send me links). But as a starting place for more dialogue, would you say that I fairly or accurately described the essence of Postmodernism’s responses to the five key ideas in the blog post? If so, then my primary response to postmodernism is to conclude that it is telling a different story about the world that Christians are telling — and thus, we don’t have common ground much at all. Again, I am interested in seeing what Smith says about this (especially, again, if I have presented the five ideas accurately through the grid of postmodernism). For me the most important part of the christian worldview is that it has a vision of the person-in-community. That individual distinctiveness adds to and sustains community. This is probably called ‘personalism’. An interesting book on personalism and sociology is What is a Person? by Christian Smith. Neither modernism nor postmodernism is a friend or ally to the Christian faith. We need to be careful to avoid the binary opposition of “modern=bad” vs. “postmodern=good” (just a little bit of Jacques Derrida fer ya!). Contextualizing the Christian faith into the present worldview is what’s necessary (and postmodernism has already become passé in most philosophical circles, although no-one has yet declared what post-postmodernism is). Kenny, I will write a longer response later tonight and give you some of my more reasoned responses. Right now I am at the Chicago Children’s Museum waiting to go to the next exhibit. I think Smith (and Amos Yong and other postmodern theologians who I happen to like and agree with) would challenge some of the ways in which your piece here implies a monolithic approach to postmodernism. But maybe it would be helpful for a working definition of postmodernism? Joshua – As usual, I sure appreciate your engagement here. It is very thoughtful. I agree with you on two points: (1) Worldview is bigger than five points, and (2) I approached the subject from a fairly comfortably “modernist” perspective. However, regarding your perspective that worldview flows from “the story-line one believes in and uses to guide their lives,” I think my outline provides good, solid, and typical “chapter headings” in the story-line that almost everyone I’ve ever met talks about, thinks about, and uses to interpret reality (in addition to the paragraph-headings like holidays, etc.). We are all always talking about (1) how we know things are/are not true, (2) Where we come from and why we exist, (3) What’s wrong about the world (4) what should be done about it, and (5) where my own life, and ALL of life is headed. My central point is that Christians have answers to all of these questions. They are not old or irrelevant questions, and they are not dismissed by postmoderns as irrelevant to postmodernism. I would sincerely love to hear the questions that would help you pull out the answers to “what is your worldview” as someone who is appreciative of postmodernism. BTW – I tend to agree with Robby McAlpine in the FB threads that postmodernism is not a worldview that exists on its own, but is primarily a reaction to modernism. In other words, it NEEDS modernism as something to disagree with in order to enter the conversation. Luke – True to my modernist form, I would love to see a list of “aspects of postmodernism” from your understanding of it. The terminology itself seems to be something that most postmoderns would shy away from using. Len Hjalmarson (NextReformation.com) and I co-wrote an article entitled “Post-Modern Possibilities: A Primer on Kingdom Opportunities in a Post-Modern Culture” back in 2003 (that seems like so long ago now…). In it, we tried to identify some of what we saw as positive aspects of postmodernism and how the Christian faith could be articulated within that context. In hindsight, we were a little too glowingly optimistic about the wonderful benefits of postmodernism (there are even some face-palm-worthy assertions that I wouldn’t stand by anymore), but it was an early attempt to recognize the cultural shift and to encourage people to find ways to contextualize the faith for a new culture. If it was me, I would start by asking about one’s origins (Why do humans exists? Why are we here?) followed by our purpose or mission in this world (a combination of your condition and solution questions). Where we are going (destination) would be the final question I was ask – as in, what do you think is going to happen both individually and corporately…. On a side not, I guess this is why I dislike Christian Statement of Faiths that start with “we believe in the Bible…” That to me is crap as I don’t believe in the Bible and then God. It was my personal experience with the Living God who caused me to value the Bible and the community of His followers. (to that end, I would disagree with your three fold understanding of knowledge – in that, I would say that the primary way we know God is through meeting Him on a personal level. Adam, Noah, Abraham and countless others didn’t have the Bible or any written or verbal Scriptures… they just met the Living God and said I want to follow that Guy. But this may be a red herring…).